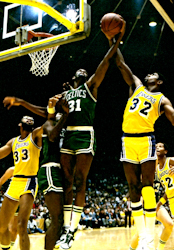 Earvin "Magic" Johnson Jr. (born August 14, 1959 in Lansing, Michigan) is an American retired NBA basketball player. He won the NBA Championship in 1980, 1982, 1985, 1987 and 1988 all with the Los Angeles Lakers. He played college basketball at Michigan State University where he developed a rivalry and friendship with Boston Celtics star Larry Bird when he faced him in the 1979 NCAA finals and three NBA championship games. Johnson's number 32 jersey was retired by the Lakers in 1992. Magic Johnson Facts for Kids. Kiddle Encyclopedia.